Montreal, known as UNESCO City of Design is celebrating its 375th founding anniversary. The organizers behind this program, 375 MTL and MTL INTL are looking for an ambassador to live in Canada for 13 months in a new high - end furnished condo (2 bedrooms) and a job that is worth Canadian $30,000. According to the official website of 375 MTL, the winner's role is to act as Montreal’s ambassador for the world and to show Montreal’s uniqueness, creativity and energy and share the party spirit, neighbourhood life, locals’ welcome, etc. The Ambassador shall be invited to all parties, concerts, receptions, and other events planned by the Organizers and their partners for Montreal’s 375th anniversary. The Ambassador’s role is to bring Montreal’s celebrations to the world. The Ambassador has to write content and publish daily on a 375MTL blog and social media. He must analyse the content of the media that he follows, follow virtual conversations and take part, if required, as well as manage social media accounts. He must also produce a series of videos to be broadcast on social media. He must also take French or English language courses. His role is varied and may require participating and creating other material as part of the Job, at the Organizers’ discretion. All you need is to submit a video answering the question - why you would be the best ambassador for Montreal. I believe the deadline is until September 4th, 2016. 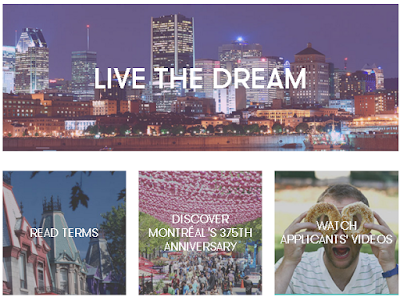 Check here 375 MTL Be Canada's Ambassador's terms and conditions.